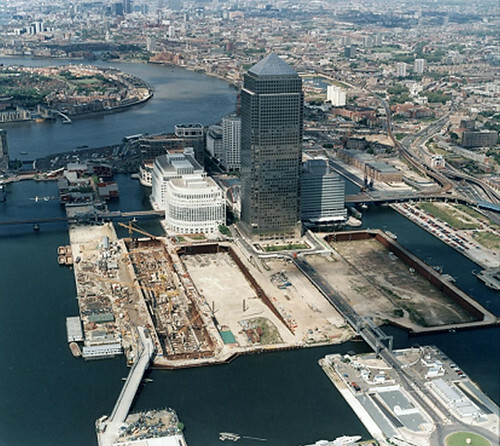 Today (2nd July) marks the 30th anniversary of the formation of the LDDC – formally, the London Docklands Development Corporation, the latest in a series of attempts to do something with the abandoned wasteland of the former London Docks which had fallen on hard times since the early 1970s. 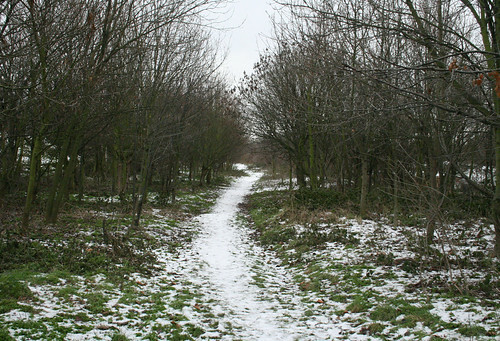 Described as being “remarkable for its tomb-like tranquillity” at the time, anyone visiting the area today might be surprised at the still staggering differences in use of the land, from the glassy skyscrapers of Canary Wharf to the empty fields and woodlands walks that surround Mudchute City Farm. People passing through the area on the DLR might see empty streets, but wont see the vast subterranean shopping centres, nor will they see the river paths or old dock houses that inhabit the centre of the Isle of Dogs. And we shouldn’t forget that Docklands included most of the riverside from Tower Bridge eastwards, Surrey Quays/Surrey Docks on the south side of the river, as well as large chunks of London to the East of Canary Wharf – large swathes of which are still waiting for regeneration to arrive. Set up by Michael Heseltine, its object was to secure the regeneration of the London Docklands Urban Development Area (UDA) comprising 8½ square miles of East London in the Boroughs of Tower Hamlets, Newham and Southwark. Although formed 30 years ago, wrangling by Newham Borough Council meant that it didn’t get full control over the area for a few more months. Amusingly, to our modern ears, the LDDC’s first annual report was very excited about how they had ordered a Computer (just the one) to handle their administration and word processing as a sign of how modern they aimed to be in their approach. They took two important decisions very early on – that they would focus on transport and housing and leave the rest to private investors, and there would be an end to the 1970s practice of filling in the docks. The docks decision in particular having shaped the distinctive appearance of the area in perpetuity. Although formed in 1981, it was the application of an Enterprise Zone in April 1982 that scrapped all the planning red tape and offered tax breaks that really accelerated the growth of the area. It was also the decision to develop the light rail service, the DLR that along with the later skyscrapers that really defined the area. However, the DLR nearly didn’t happen and it was only the decision not to proceed with the Jubilee Line extension (too expensive at £450 million) that forced them to look for alternatives. They were very keen to avoid a bus based transport service, and the DLR which once snaked through empty wastelands is largely credited with encouraging employers to move to the area, and it undeniably defined the area aesthetically – as well as technologically with its amazing driverless trains. Not all their ideas were so wise, and fortunately the plans for the helicopter park and airship services were not carried out. The other dominant feature of the Docklands is obviously, the Canary Wharf cluster of skyscrapers. Yet amazingly, that was never part of the early plans. It was expected that much of the regeneration would come from media companies and small offices – not as a competitor to the City of London. It was on July 17th 1987 that a contract was signed to develop the huge Canary Wharf region and abandon the earlier focus of low-rise offices, the last few remnants remaining at Heron Quays and close to South Quays – and both planned to be replaced with more towers shortly. An early artists impression of what the area would be like is not that far from what it ended up with, although the office towers south of Canary Wharf were not expected, and the low-rise offices by what is now Riverside South would have looked a lot nicer than the glassy edifice planned for the area now. It was also that same year that saw the DLR finally opened, but as an indication of how the Canary Wharf development was a surprise, the small Canary Wharf DLR station was almost immediately demolished to make way for the much larger station that sits there today. As I am sure we all know, the development hit financial problems, was empty for years and only after the end of the early 1990s recession did it finally start to get companies moving into the area. The eventual arrival of the Jubilee Line – which cost rather more than the earlier estimate of £450 million – probably did more to secure the future of the area though. Looking ahead, I think it is a bit of a shame that the architectural detailing on the original buildings, which while very much of its era do give the buildings a defined character was not continued with the later glassy towers, which do have a very generic look to them. One thing I do like though, and it gives the area as a whole a very distinctive look – apart from the docks – is that most of the office blocks lack any shops on the ground floor. If you walk though most cities, the offices sit on top of shops, but not in Canary Wharf, where the aesthetic of the area is maintained from pavement to sky, unimpeded by garish signs for coffee and sandwiches. All the shopping is underground – and dominated by coffee and sandwiches, and mens shirts. Of course, hiding the shops underground is what leads to people passing through the area at weekends to claim it is abandoned and empty. Try looking underground, it is usually heaving with thousands of shoppers. Looking ahead, there will also be the Wood Wharf scheme starting in a few years, which will enlarge the office space by a third again and when Crossrail is finished, even more offices to the North of Canary Wharf to occupy land that is currently a building site. The LDDC was finally abolished a shade under 17 years after it was formed, in March 1998 and planning controls handed back to their respective local councils. However, 30 years later and building work is still going on, land is in places still derelict, and it will probably be another 20 years at least before we can say every single plot of 1970s wasteland has been turned into something else. Whether that is a good thing or not, I leave to you to ponder. ‹ How deep is every tube station on the Underground? Thanks for this. I’m now in awe of what the LDDC achieved, whilst at the time, like many people, I was very dismissive of it as “Thatcherite”. When Southwark got a labour council in 1982 they refused to have any communication with the LDDC! Amazing but we’ve moved on. The regeneration has been an enormous achievement which has evolved not by some initial huge masterplan but adapting as circumstances changed, and varies from the futuristic, sleek Canary Wharf area to the secret that is the Rotherhithe area. I’ve become a fan. I’m a recent transplant to the Isle of Dogs, and it hasn’t been an easy adjustment. But reading about the very interesting history of the area does help me feel more connected to my new home. Thanks for this great post! It did very good things, but it also did things which were not so good. A statement that can be applied to every single event in human history. The second picture (The DLR under construction in 1987) actually shows Canary Wharf under construction. The DLR in its original form was completed, with a station at Canary Wharf similar to the other original stations, before work started on the Canary Wharf development. The station was dismantled before the line opened to the public, but for some time the trains stopped at the site. (West India Quay station is just visible in the background).